I am a children’s book illustrator and author. I love to visit schools and talk about what I do for a living. This weblog will be a way of continuing to do that: I’ll post sketches and paintings in progress to show you how I work. Please visit my website and my Etsy shop. HI! This is fantastic! I am working as an illustrator for a while BUT in September and October I will have my first school visits! So thank you for sharing your experience here. I like your style! The mummy is really, really cool! Hi. I wrote a children’s book and I could use an illustrator. Would like to talk, eventually, about options for utilizing your talent. You know, you don’t need to get your manuscript illustrated in order submit it to a publisher. As a matter of fact, a manuscript already illustrated is more likely to be turned down by an editor. yup. It is exacly the same here in germany with those publishers and manuscripts. This is fantastic! Educational and eye opening. I’m pondering every page in the hopes it will assist me in my own work…thanks for sharing such great works!!! thank you for setting up your blog. I find your work a real inspiration. Right at the moment I am half way through ‘how to be an illustrator- cantos 2’. If you get have a minute would you mind giving my website the once over? This is amazing stuff! It is so fascinating to get a look inside the process. Thanks for sharing! Great to hear from you, Jeff! When do we get to see your graphic novel? Love your Pirate Bunnies and the Pirate Bunny sea shanty! A friend sent me your blog because I work as a pirate on South Padre Island in Texas. Check out our Pirate ship on our website…love your work! And come sail with us if you get the chance! Thank’ee, Ruby! The Black Dragon looks bonny—and so do you in your sea-boots! I was sent here by a Mr. Finn and a Mr. Gillett, I too am a former alum, hope you remember! I just wanted to say ‘hello’ and say that you’ve got some really, really nice stuff – but it’s what I expected! Mr Finn & Mr Gillett? Weren’t they a vaudeville act back at the turn of the last century? They had a hit with ‘Me Auld Irish Mither’—Finn took the tenor, Gillett the baritone…okay, maybe not. Somebody linked from your blog to mine and when I had a look I discovered that I am on your blogroll! I feel honored. And thanks for promoting me. I am putting you on my blogroll as well. Hello John. My name is Danny Haiduk, I’m graphic designer and i like very much your illustrations. I would like to have a permission to use one of your sketchs to include in a little project I’m doing in this moment. 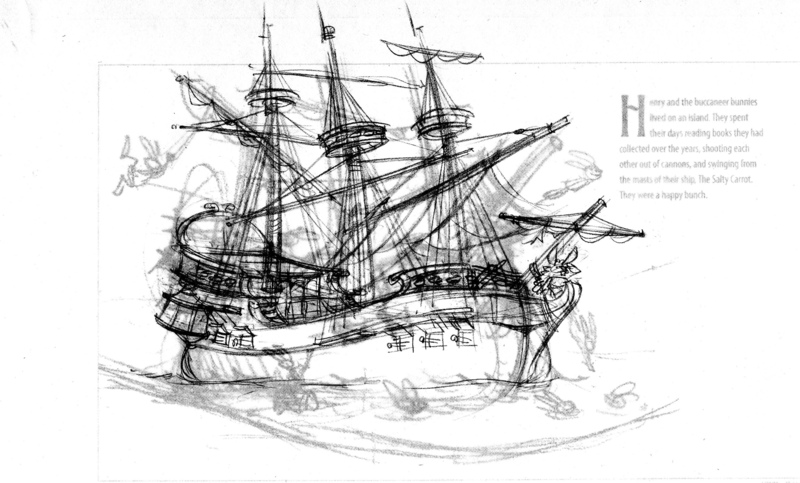 The illustration I’m talking about is this ship > https://johnmanders.files.wordpress.com/2009/09/ship190.jpg If I have to pay any cash, how much would be? Thanks for your interest, Danny! I’m not able to grant you usage rights for that image because it’s an illustration for the picture book, Henry & the Crazed Chicken Pirates. To use the image elsewhere would violate my contract with Candlewick Press, and their lawyers would not be happy. I could draw you a new ship if you like. Please contact my agent, Mela, at http://www.mbartists.com/cgi-bin/iowa/contact.html to discuss fees & production schedule. Me encanta tu trabajo, eres todo un artista. Un saludo y un abrazo desde Colombia…. Many smiles from sunny Bulgaria and me ! Thank you, Anita! Please tell us about your work and studies sometime when you’re not too busy! Do I have to have an agent in order to get my children’s book published? My experience is that having an agent certainly helps. My agent—an illustration rep, not a literary agent—has shopped projects of mine around to art directors/editors and gotten me interviews that I would not have gotten on my own. However, if you have a manuscript to submit, there’s no reason why you can’t send it yourself. A book you should own is Children’s Illustrators and Writers Market (Writers Digest). A new edition comes out every year, and it is filled with listings for children’s book and magazine publishers, contact information, and guidelines for submitting manuscripts and art samples.